Hoo boy. Take one good idea wit promise, sell out and make it for kiddiez to cash in on merchandizing potenshul, den make movie about it but don’t bother paying for decent script. 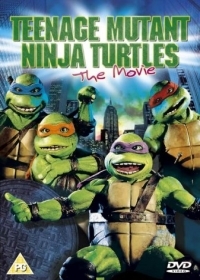 Just trow together any old lazy ideas, some lame jokes and dubbing, and voila – you have Teenage Mutant Ninja Turtles, a movie made twenty yearz ago back when kidz a lot eazier to impress. Monster not understand how history judge Howard de Duck so harsh but give dis movie a free pass. Stop fighting over pizza and get back to breakdancing! City full of crime. Woman mugged. But teenage mutant ninja turtles to da reskue! Dey fight to lame late 80’s synth muzak! Dey use dated hipster doofus termz like “Bodashus!” and “Radikal!”! Dey live in sewerz – which monster tink pretty appropriate becuz dat where dis stinker of a movie belong! Stuff happen. Me not bore you wit details. 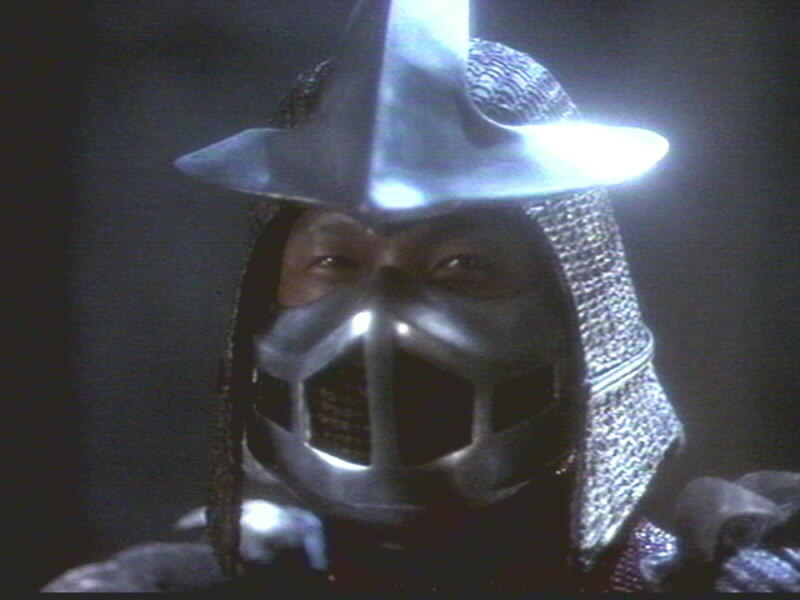 But turtle master, Ratso Rizzo, get kidnapped by bad guy in samurai hat doing bad Darf Vader imitashun. Turtles waste time fighting over pizza, gestikulating wildly like bad stage aktors, and making friendz wit newz reporter and vigilante who dress like maniak from Friday de 13th. Dese two fall in love for some reazon even though he a brainless missoginist and she have mebbe half brain. Or mebbe not. You know a movie is bad when villainz even stoopider looking den mutant turtle heroez. 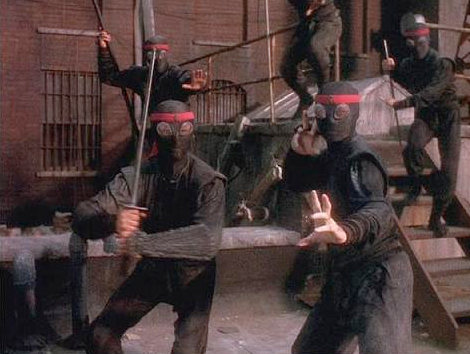 Itz ninja turtles versuz ninja ninjas! Turtles fight wit sharp weaponz but never aktually stab anyone wit dem. Monster guess dey more of a fashun statement. Look out! 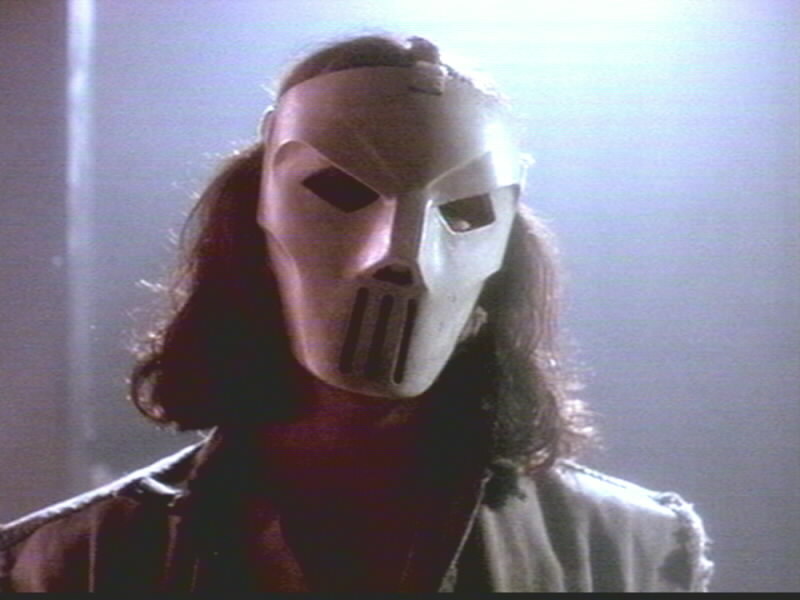 It Jason Voorheez! 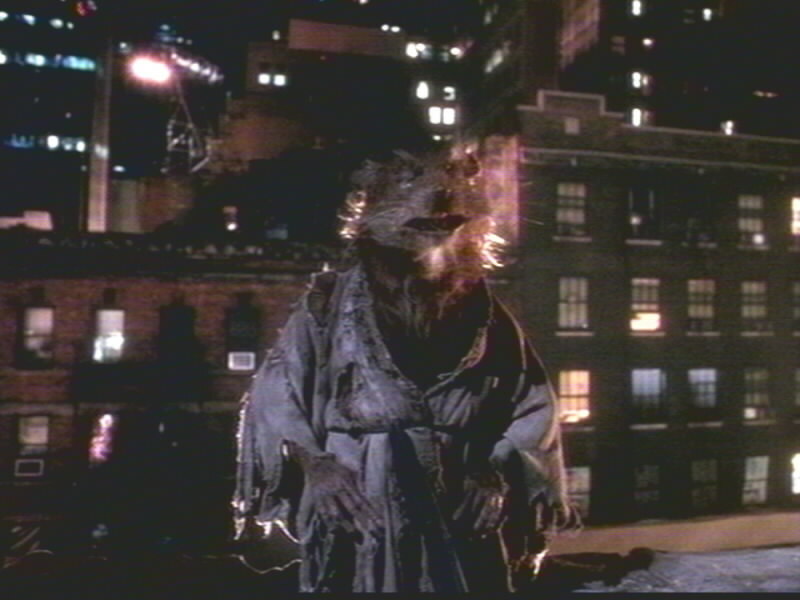 Ratso Rizzo saved! 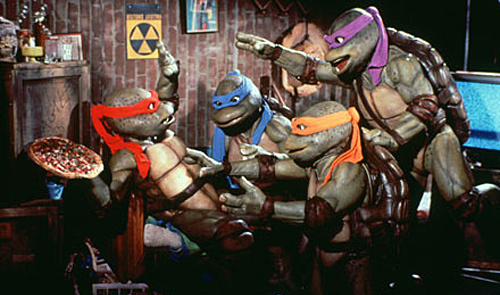 Turtles find out someting audience figured out one hour earlier: sekret identity of Darf Shredder. He fall off building and die. Until next movie anyway. Newscaster and troglodite get together. Turtles tell more lame jokes. And monster wish he rewatching Superman and de Mole-Men instead. Verdikt: Verdikt is monster finished watching Teenage Mutant Ninja Turtles moviez. One enuf to last a lifetime. Rating: 4 chocolate chippee cookies. And only becuz dis a kidz movie. Adultz and anyone dat graduated grade six need not apply.